Mention the words “one to one” or “digital curriculum” and the widely referenced SAMR model is likely to enter the conversation. Few other models are brought up as frequently with educators who are transitioning their schools to digital devices and curriculum. But does SAMR continue to meet the need of describing the depth and breadth of change needed in pedagogy? What’s wrong with this, you say? Only just one tiny thing. It is used to describe change within the traditional paradigm of school, whether that be an individual classroom with a teacher’s individual practice or a school or a district. It rarely considers contextualization against the new models of school that are being created and experimented with. Rarely does SAMR spark the conversation of changing the paradigm. Practically speaking, this is a major and fundamental flaw. Why? Because the only reason education is motivated to transform in the first place is to catch up to outside expectations. In most instances educators and administrators are not in tune with the workings of industry and consumer culture. The entire perspective of substitution up to redefinition for most viewers coming from the education industry is already—and only—contextual to the standing infrastructure of education. A teacher. A classroom with walls, a place. It would be easy to keep the view that these are the given barriers to the current educational environment. And that the freedoms to substitute, augment, modify and redefine are constrained within those barriers. Wouldn’t this make everyone’s job so much easier than throwing out the entire reference point and starting from scratch? It’s been tried, you might say, to redefine the paradigm itself. But it’s so out-of-sync with the majority of education’s reality of what education should be that the notion to fully transform had to be reined in and the systems of the past restored to practice. Maybe sticking to the status quo is better, right? The answer is emphatically, no. That “think” is old news. Again. The seeming energy-starved low-impact educational constructs of the past are being replaced with the likes of Minecraft, and a distance anywhere-anytime potential freedom-land of learning that is all-consuming to youth. The super-engagement of games challenge what we think of as learning. The connectivity of the Internet make learning possible literally anywhere and in many modes. From birth, learning occurs in everything we do. And now we have the technology to build learning environments that will allow the natural progression of learning without the limitations of artificial milestones. Students can explore holographic “worlds” complete with machine-learning algorithmic builds to favor individual students. 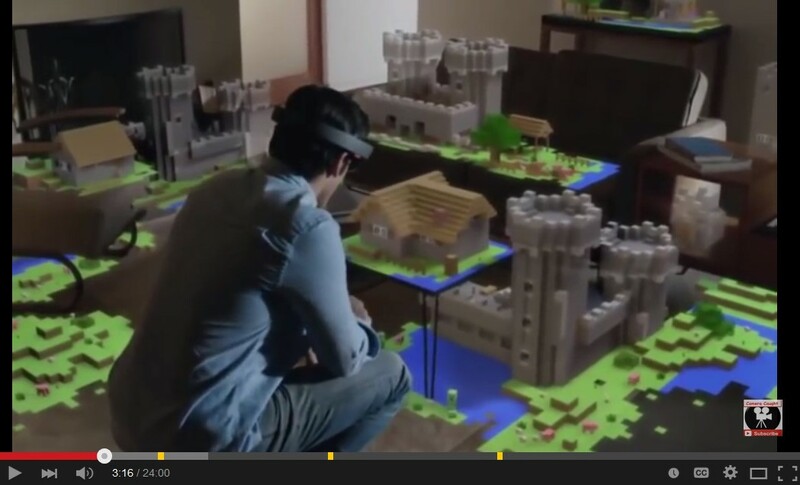 New innovative tools are changing the way anyone can learn and view the world such as in this promotional video for the Microsoft Hololens. The learning laboratories of the future are virtual or some combination of virtual with reality. They are more natural in that they are autodidactic—self-driven-from-anywhere—while also being capable of requiring basics like standards. Various vendors and even other schools are mastering it for digital distribution and mastering curriculum software. Learning will gravitate towards the best teachers and the companies who are providing the most engaging and effective content. Now that the internet can provide a one-stop shop for any type of curriculum or course possible, and students are now graduating having never attended a physical-location school their whole lives from State-led online charters in multiple States, what’s the use of SAMR? What we need to be talking about is the redefinition of function. SAMR inside a greater system that is obviously untethering people from physical location in work, in entertainment, in worship and even in some relationships. Form follows function, and the current educational forms are not aligned to new function. The real question in education surrounding SAMR is why we need the artificiality of an institution for learning. It imposes an artificiality of space, physicality and time. With the internet we have conquered all three. When the function of learning can be done directly, then the form of learning can be a one-to-one direct model with no intermediary of space and time and personnel. There are, of course, a few provisos. For real redefinition, everyone needs to be scrappy in the new realities, and know what these are – blended, virtual or what? The best of what you do needs highlighting. The highest skills need marketing. In the Age of Experience, people will pay for higher value educational experiences, but only if they are above the otherwise expected experiences. Consumer society now expects a very high level of engaged screen learning and has lived in society with focused intent on providing quality experiences like Amazon, Starbucks, Disney, speedy service stations and self-check-out groceries. Your use of SAMR will lose unless each individual and school takes a journey into the future and sees what skills are actually irreplaceably human. You see, even with a holographic trip to China to learn about the culture and the history, what good does it do a student who does not have over their shoulder a teacher—a coach—a guide—a mentor—who can help them explore the interrelationships with their own life so they can evaluate and make informed decisions? Consider, as just one example, Chinese exchange students in an American school, or immigrants in arriving in a new neighborhood—how does an American student honor them and their culture? What about the sense of time that the Chinese have because they are predominantly Buddhist and believe they live again and so built a culture that is long-enduring with great ritual and timelessness. How can the student consider that against their own culture? Human touch is not and will never be ubiquitously replaceable. Mere questions posed could be online, it’s true, but that magical interaction with a leading figure, the teacher, does something to prove inquiry and answer are dynamic to an individual student. It’s no different than a live audience clapping for you. There is just no substitute for human leadership, but it must actually be that. The low-value activities of pointing-out next lessons, of assigning units, of testing, of modifying learning paths, those are all being subsumed by new technologies, or they will be soon. The machine won’t smile at you in quite the same way, though, no matter how many emoticons you download. The high-value activities need solid definition so that true redefinition of the teachers role as a grand Socratic-like leader and esteemed guide can be branded, implemented, and then utilized by institutions to hold unto themselves the otherwise escaping populace of would-be students. SAMR is incomplete, that’s what’s wrong. To really implement it, consider the competition of the outside world, including new realities. In his book, Infinite Possibility, Joseph Pine talks about there being now six different realities between what is purely “real” and what is “virtual.” Industry is already using all of them. Now revisit SAMR with your new vision.